Restaurante is a beautifully designed restaurant WordPress theme with advanced booking features allowing you to not only showcase your restaurant, but also accept reservations. The theme is powered by our advanced Tevolution plugin and the Appointment add-on. 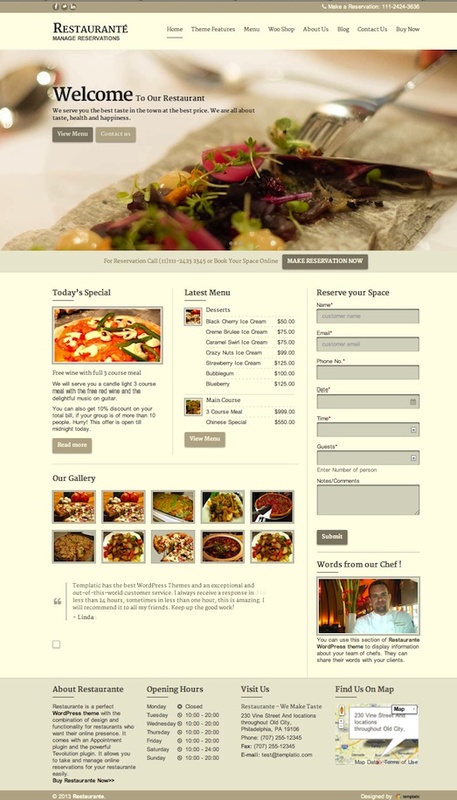 Both plugins are provided for free with each Restaurante WordPress Theme purchase. You can easily create a website for your cafe, restaurant, coffee shop, dessert shop, fine dining restaurant, pizza shop, and even a bar. Features also include responsive design, WooCommerce enabled, widgetized, unlimited colors, calendar module to manage online reservations, accept reservations online, scrolling featured images, food menu cards, social media icons, social media integrated, business hours, google maps integrated, contact form, photo gallery, testimonials, and more.